Suitcases often get damaged in travel and pretty easy to get into if you are trying to steal from people but this hamburger suitcase cover will help you with all of that. The suitcase cover is available in many sizes and is highly flexible so that it will fit snugly around your luggage and it connects with a zipper on the bottom and it keeps all handles and wheels accessible. 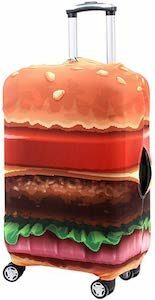 The suitcase cover looks like a giant hamburger and that makes it really fun especially if you love to eat a big burger. Finding your suitcase now is easy and it will be protected as the cover is over it and if the suitcase cover gets dirty then no worries as it is machine washable. 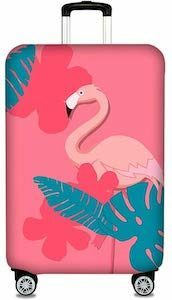 Now there is a fun pink flamingo suitcase cover you just have to see. 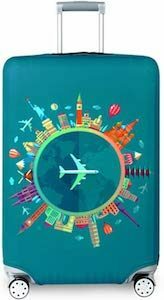 The suitcase cover is available in 4 sizes to fit perfectly around your suitcase and material is really flexible to fit snugly around the suitcase and it will keep handles and wheels available so you can travel with it like any suitcase only yours will look cooler and will protect your suitcase from damage. The cover is pink with one it some leaves and then the flamingo just standing there as you are used to with this kind of birds. 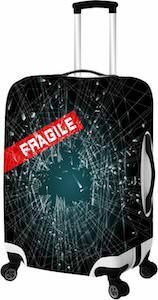 If you like to make it clear that your luggage is fragile then you should be checking out this fragile broken glass suitcase cover. The suitcase cover is available in 3 sizes so that it will fit your suitcase and it will fit snug around you luggage to protect if from damage. You can see that the cover has a print of broken glass and a red banner that says “Fragile” on it and maybe this will help your stuff to be safe from harm. 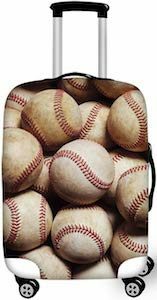 And by having this great suitcase cover you also make it a lot easier to spot at the airport while waiting for your suitcase. 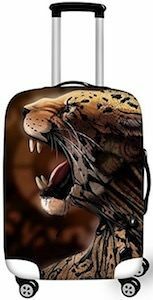 If you like your suitcase to look amazing then you just have to check out this gears suitcase cover as it can make almost any suitcase look amazing. A suitcase cover is not only great at making your suitcase to look amazing it also protects it from scratches and it makes it a bit more difficult for people to get into and that prevent quick thefts. 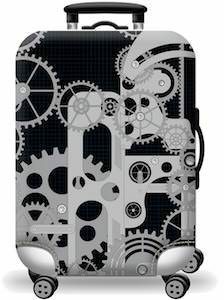 The suitcase cover is black and on the black fabric you can see in gray lots of gears and it makes me wonder what it is doing. The suitcase cover is available in 3 sizes and is stretchy so that it will fit snug around you luggage. Suitcase covers are a great way to protect your suitcase and make it look so much more fun and now there is a dogs suitcase cover. 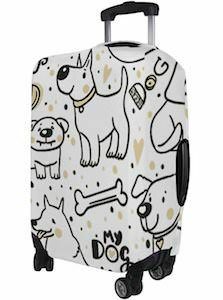 The white suitcase covers is covered in drawing of a bunch of dogs and besides the dogs you can find other details like bones and toys and it says “My Dogs” and “Dog” on it too. 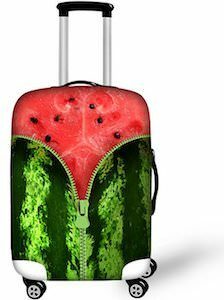 You can get this fun suitcase cover in many sizes and all will keep the wheels and handles available for use and the strong cover is very flexible so that it can fit snugly around you luggage. So if you like dogs then you should check this suitcase cover out. 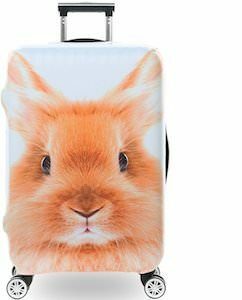 Everyone seems to have the same boring black suitcase these days but thanks so this cute bunny suitcase cover you can make you suitcase look amazingly cute and protect it from theft and damage. You can get the suitcase cover in 4 sizes and they are flexible to fit snugly around your suitcase and yes, wheels, and handles are all still working as expected. On the suitcase cover you can see a big head of a bunny and that is just fun and I wonder if the Easter bunny is using this around his suitcase. Now you can travel without having to worry if you can spot your suitcase because their will not be many rabbit suitcase on the luggage belt at the airport.